The Club is open every weekday Monday to Friday from 1 Oam. Men and over the age of 55 years are welcome. Come along into the club either part in our activities or participate in one of the classes. You may also enjoy a cup of tea, a chat, read daily newspapers or just relax after shopping. Thursday: Bridge (all grades), Music - Keyboard & Piano Beginners Whist at 2pm. Friday: Decoupage, Darts, Indoor Bowling at 8pm (Men only Sun. Afternoon: Outdoor French Boules and Afternoon Tea Dance in club. (Jan and Sept and other activities. Make new Friends and meet old Friends in the Sen Citizens Club, Swords! Nessa Childers, Independent Dublin MEP, last week hosted a delegation from Swords Senior Citizens to the European Parliament in Brussels, accompanied by Paul Mulville, Independent Councillor, Swords Ward. 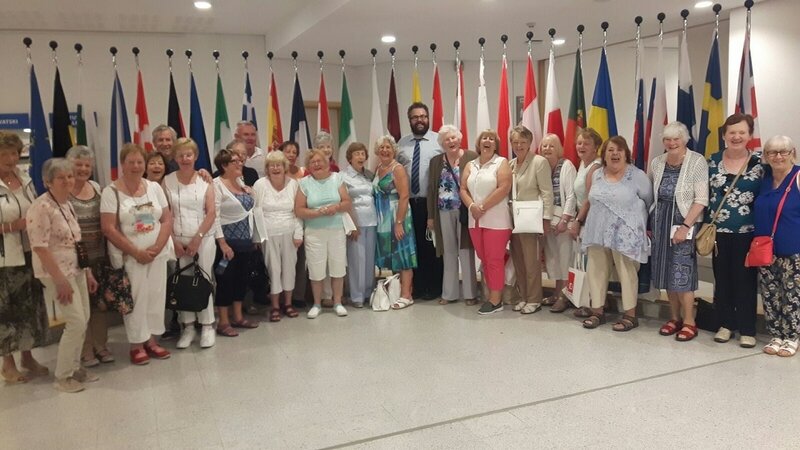 “I was delighted to host the group from Swords Senior Citizens, along with local Cllr. Paul Mulville and Dublin trade union and political activist Paul Dillon. In particular, as we face into Brexit, I was very glad to discuss Brexit with the delegation, and to hear their views on how it will impact the island of Ireland and our country’s strong relationship with Britain, where many of our family and friends are living”, stated Childers. ​Photo attached, Cllr. Paul Mulville, and Swords Senior Citizens group, including committee members Eileen Power, Patricia Stephenson and Robert Mooney, at the European Parliament, Brussels.